The following list of Rules and Regulations are intended to help you enjoy your swim in a safe and pleasant manner. If you have any questions, please feel free to contact us or see the pool staff on site. Your collaboration in following these safety regulations will help ensure your safe enjoyment of these facilities. The manager on duty has the final authority on all safety-related issues. Children must be at least 48” tall, or have passed the swim test to be in the water without a responsible person, 16 years of age or older, who has paid admission, and who remains in the water and is within arm’s reach of the child. The swim test consists of continuously swimming 25 yds. (1-Length) in the face down position, without using the bottom, pool walls or lanes lines for support; swimmers must also demonstrate the ability to remain in one place while maintain the head above water and (treading water) for 1 minute. Hand paddles may be used only when a swimmer is alone in the lane. All equipment (kickboards, pull buoys, jogging belts, etc.) must only be used for its intended purpose. Kickboards and pull buoys may be used while lap swimming only. Diving is permitted only in areas where the water is 9 feet deep, except during swim meets or supervised swim practices. Masks, snorkels, and fins will be allowed for lap swimming or during instruction. Fins must be training fins (constructed of soft material and not wider than eight inches). Flotation devices are permitted in shallow water at the manager’s discretion. An adult must be within arm’s reach of the child. Socializing with or distracting any lifeguard on surveillance duty is not permitted. 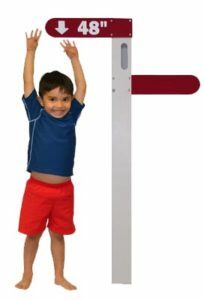 The use of the starting blocks is restricted to approved swim practices, swim meets, and instruction. Ball playing is prohibited on the pool deck. Balls provided by the pool may be used during instruction and at the discretion of the manager. Baby strollers must remain on the deck with brakes locked at the shallow end of the pool and at least 4 feet from water’s edge. Diving Board Safety Rules – These rules apply when the boards are being used. Divers must wait at the bottom of the diving board ladder until the previous diver has reached the side of the pool. Only one bounce per dive is permitted, except during instructional activity, under the supervision of an Arlington Aquatic Center approved instructor. Front dives and flips are allowed straight off the end of the board. Cartwheels and handstands are not permitted. The manager may restrict dives based on safety concerns. Immediately after surfacing, divers must swim to the ladder and exit the pool. Swimming under and hanging off the end of the diving board is not permitted. Goggles, masks or floatation devices may not be worn when diving off the board. Adjustments of the diving board fulcrum may only be made at the discretion of the lifeguard, coach or instructor. Running dives are not allowed. Diving approach and hurdle are permitted. Bather load must not exceed posted capacity. 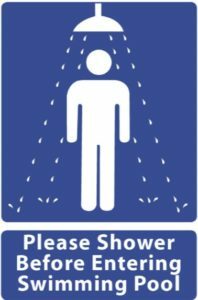 Patrons must walk in pool and locker room areas. Glass containers or breakable objects of any kind are not permitted in the pool area, locker rooms, spectator areas, or outside deck. Shoes worn outside may not be worn on the pool deck. Persons with skin infections, open wounds, and nasal or ear discharges are not permitted in the pool. Food and drink are not permitted on pool deck and in locker rooms. Water in plastic bottles is allowed. All injuries occurring within the pool area or locker rooms must be reported to the manager immediately. A single short whistle blast is used to gain a swimmer’s attention. A single air horn blast may signal an emergency; please exit the pool immediately and listen to the lifeguard for further instructions. The pool will close when electrical storms are reported within 6-miles as determined by the manager, and remain closed for 30 minutes after the storm moves away from the area. Managers will use a combination of the Flash-to-bang method and weather applications, to determine storm proximity. All persons using the pool must check in and pay general admission or present valid lesson, class, membership or swim card. Persons leaving the pool must pay to re-enter. All persons must show proof of Arlington residency or pay non-resident fees. Individuals enrolled with AAC or a rental group will be admitted without charge, to participate in their practice session in the area reserved for that practice session and only during the time of that class or practice and under the supervision of the designated coach or group representative. Memberships and Passes are NOTrefundable or transferable. Swim passes expire 12-months from the date of purchase. Children under 8-years of age must be accompanied by a responsible person 16 years or older. Children 5-years or older must use appropriate gender locker room or the family changing rooms. Proper swimming attire is required; must be non-transparent, and must conform to standards of modesty and decency. Use of the locker room facilities is limited to patrons and students. Activities unrelated to swimming such as washing clothes, coloring hair, etc. are not permitted. Locker rooms are available 5 minutes before opening and 15 minutes after closing time. Patrons who engage in inappropriate or threatening behavior (verbal or physical) may be refused admission or be asked to exit the premises. Individual and group instruction may ONLY be provided by APS/DPR staff or by individuals authorized by APS. Water Joggers are encouraged to use the diving well and designated areas as scheduled. Lap lanes (SLOW) may be used as available and at manager’s discretion. Select a lane appropriate to your speed— fast, medium, or slow. Stay to one side of the black line. Select a lane appropriate to your speed. Swim to the right of the black line, in a circular pattern. 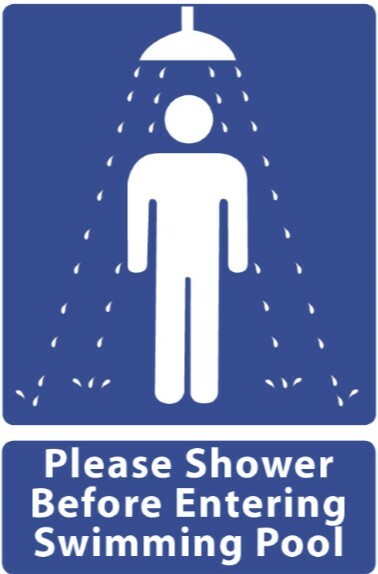 Prior to joining a lane, be sure to communicate with others in the lane to begin circular swim. If open, move to other lane if you are too slow or too fast for the lane you are in. Pass at the end of each lap, after tapping the foot of the swimmer in front. The swimmer being passed should wait on the right side of the lane. If the left side of lane is clear, pass swimmer on the left. Be sure there are at least five yards of clear water to the wall, before passing. Cut over into the lane going in the opposite direction with no turn. Be sure there is at least 10 ft. between you and another swimmer headed in that direction. When joining a lane, do not dive or jump into a lap swimming lane that contains another swimmer. Be aware of other swimmers in the lane. Try to maintain a 10-ft. distance between yourself and the swimmer in front of you. 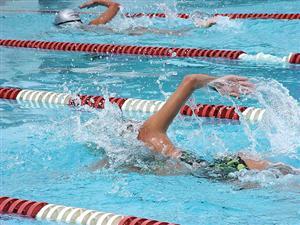 Refrain from doing strokes with wide kicks and/or wide arm strokes (Butterfly & Breaststroke). Any questions about the rules? Please speak with the manager or staff at the front desk.